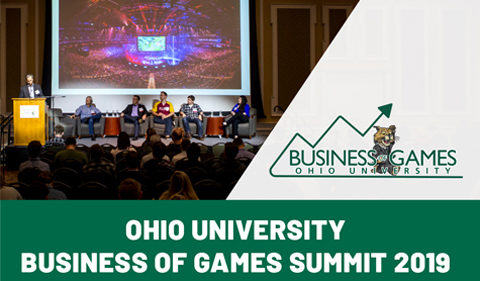 For the second year, national gaming and eSports leaders and entrepreneurs convene in Athens to talk about the state of the gaming and eSports industries and emerging digital trends at the Ohio University Business of Games Summit on Friday, Feb. 22, at Baker University Center. Admission to the summit is free, but registration is recommended. While many industry conferences focus on technology and development of games, this conference primarily deals with the business aspects and offers speakers and panels focusing on the perspectives of young entrepreneurs, investors, developers, publishers, players and spectators. Ohio University’s Center for Entrepreneurship, a partnership between the College of Business and the Voinovich School of Leadership and Public Affairs, along with the Game Research and Immersive Design (GRID) Lab, a part of the Scripps College of Communication, host the event.